Baby Bunco by Julie B Cosgrove is a delightful Christian cosy mystery and I really enjoyed it. It is the second book in the Bunco Biddies series but can be read as a stand-alone. 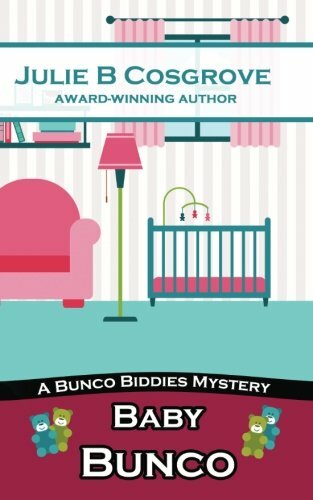 Baby Bunco has all the elements that entertain – a murder, a mystery and mayhem caused by a group of super sleuthing sixty something ladies. Very reminiscent of a group of Miss Marples and highly amusing. The crimes are serious but the ladies are not. They are keen to solve the mystery but grounded in routine and they love their food and pets. There is a camaraderie between the women and between them and the police. Their age is respected, as is their opinion. Their friendship is clearly visible. The ladies are kind, caring and capable. I adored Baby Bunco. It was wonderfully written and just perfect to wile away an afternoon. The ending has left it open for another book – more please Julie Cosgrove.